This month’s featured fly fishing artist on MidCurrent is Judy Haas, a Colorado painter and photographer with a eye for complex patterns, especially those revealed to her in wild fish. Haas hand-makes the pastels she uses in her paintings, a process that she says imbues the pigments with a unique richness and saturation. 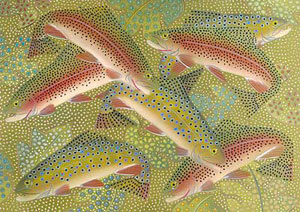 You can see more of Haas’s fly fishing art on her Web site.